Pferd Inc., Milwaukee, WI, offers miniature brushes for precision, highly repeatable cleaning, light-deburring and surface-conditioning results on a variety of materials, from hard alloys to soft aluminum. 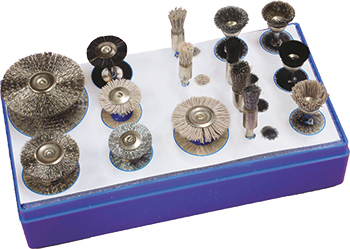 The lineup of wheel, cup and end configurations includes stem-mounted miniature brushes ideally suited for the precision applications required in many industries, including electronics, medical, aerospace and jewelry. The brushes are available with a selection of filaments, including carbon-steel wire, stainless steel, brass wire, aluminum-oxide and a variety of soft or stiff natural bristles. All of the miniature brushes mount on 1⁄8-in. stems, and are recommended for use with variable-speed die grinders. Wheel brushes come in diameters to 1.5 in., cup sizes in 9⁄16-in. dia. and end configuration to 5⁄16-in. dia. The M-Brad aluminum-oxide, 6.12-nylon microfilament evenly encapsulates various abrasive grit particles on the surface as well as throughout the nylon filament. The flexibility of strands makes it uniquely effective when deburring complex parts. It reportedly yields consistent gradual cutting action, permitting precise control in applications ranging from cosmetic surface preparation on brass or soft aluminum, to edge blending on materials such as titanium and carbide. In addition, M-Brad brushes reportedly yield longer tool life than non-woven synthetic abrasive products, and are suitable for wet and dry surface conditioning, although the use of coolant is recommended.